2 Hook IV Poles, 4 Hook IV Poles, Ceiling IV Poles, and Telescoping IV Poles. Scroll down to see our selection of IV Poles for sale. IV poles are used widely in hospitals, clinics and facilities. 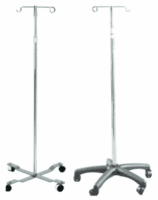 We carry a large selection of IV poles including 2 hook IV poles, 4 hook IV poles, ceiling mounted IV poles and multiple pack IV poles, with all IV poles having either a 4 or 5 leg base. IV poles are devices used to hold bags of fluid being administered to a patient. Typically having a rolling base and 2 to 4 hooks, IV poles are portable. Giving the patient the ability to take their IV pole with them and still receive their necessary medicines. Ceiling mount IV poles are used in hospitals to save space in small treatment rooms. IV poles can also be used in residential health care enabling mobility from room to room..